I can’t believe it, but we have finished the practical and course material! Now we just have to get through exams and final case presentations before we are truly pushed out of the nest. I shouldn’t say “just the exams” though, considering we have three written and two practical exams it is certainly not to be taken lightly. I must compliment our dedicated team of instructors though, as long as I study the material carefully and keep working on horses and dogs at every opportunity, I know they have prepared us extremely well for the final and certifications. I sure wouldn’t want to let them down! Doing well on exams and achieving high scores on the practical sessions is all well and good, but the critical test that we must pass every day is the one that challenges our ability to translate this knowledge, as well as integrate it with our skills as veterinarians, into results for our patients. These are the real world tests that really matter. I have been working on many horses and dogs lately, and have grown to appreciate the spontaneous and honest feedback that they give me during an adjustment, if I listen carefully and sympathetically to them. Animals don’t suffer (or benefit!) from the placebo effect. No matter how badly you want them to feel better, they will not pretend to improve just to make you happy. In many ways, this holds us to a rigorous standard of practice, as nothing less then your best and most thoughtful efforts will create a positive result for your patient. Empathy, positive intent, and maintaining the lines of communication with an animal during the session are of paramount importance. This is also true for any veterinary examinations and procedures we perform during our daily clinical activities, so I continually have the opportunity to develop this skill! 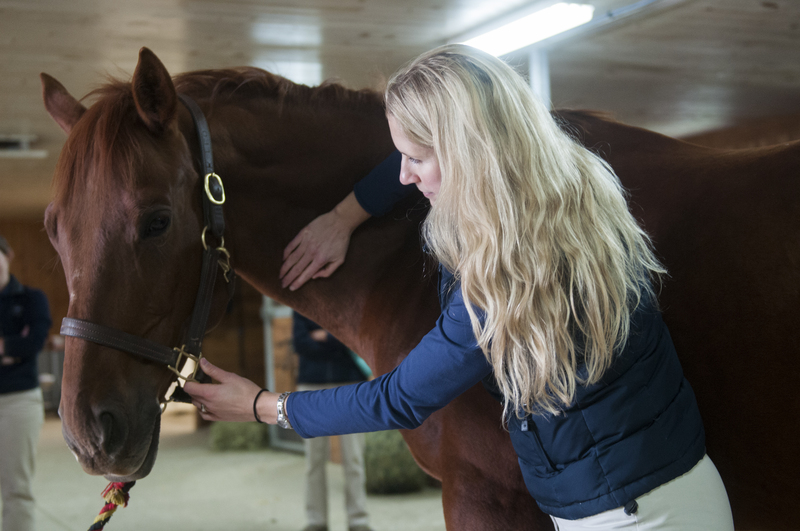 Horses are so in tune with their bodies that they speak a rich language through their posture, facial expression, and the energy that you feel in their bodies when you put their hands upon them. This is the beginning of your conversation with them, and if all goes well, they will go from tense and uncertain to relaxed and in a state of trust as you move about them. Whenever I adjust a horse, I watch for signs that we are progressing in the right direction- sighing, chewing, soft eyes, yawning. The opposite reactions are also valuable information as you approach a tender area or assess the response to your adjustments. I love the dialogue we share, even though a word is never spoken. This kind of connection with an animal is one of the privileges and highlights of my profession. I look forward to developing this with my patients every day. This entry was posted in Equine Chiropractic and tagged back pain, chiropractic, chiropractor, equine, horse, lameness. Bookmark the permalink.